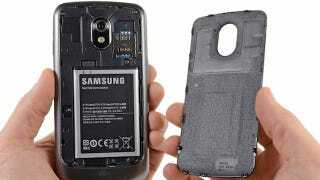 The axe-wielding maniacs over at iFixit are tearing Samsung's Galaxy Nexus limb from limb! O, the humanity! If you've been eager to see what makes Google's new flagship beast tick, here's your photographic anatomy lesson. iFixit is still making sense of their findings since they only just finished. So far, there's nothing super surprising, save for one little thing: the Galaxy Nexus' NFC capabilities all seem to come from a sticker that's attached to the phone's battery. Could this sticker be placed on virtually any Android phone to make it NFC capable? If I were a betting man, I'd say yes.